Ebenezer Scrooge is a man in dire need of a second chance. Is redemption possible for such a greedy, dark and sad character? 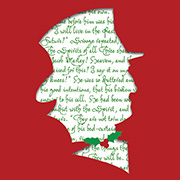 The Redemption of Scrooge, from Matt Rawle’s The Pop in Culture Series, shows us how the teachings of Jesus can be found in Dickens’ Christmas classic. From the ghosts of Christmas past, to the Life of the present, and the resurrection of Christmas future, this Advent study will “bless us every one” and reinvigorate our spiritual journeys as we look at this familiar story through the lens of faith. This advent season study with us at 9:30 AM in room 210 & worship with us at 10:30 AM. December 2nd – Bah! Humbug!